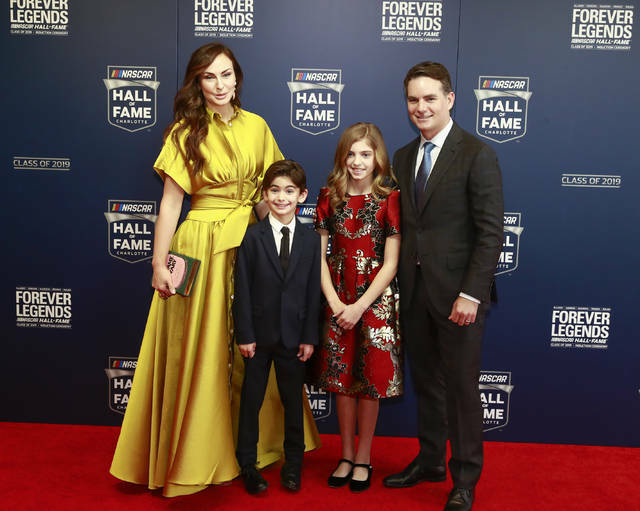 CHARLOTTE, N.C. (AP) — Jeff Gordon’s immense influence on NASCAR was highlighted during a star-packed Hall of Fame induction ceremony befitting a driver who changed the trajectory of an entire sport. Gordon was the top vote-getter in the 10th class of the Hall of Fame, which included the late drivers Davey Allison and Alan Kulwicki, as well as team owners Roger Penske and Jack Roush. Gordon received 96 percent of the vote, falling just short of the Hall of Fame’s first unanimous selection, in his first year of eligibility. This class was the first in which all five inductees competed against each other at the same time. Gordon made his Cup debut in the 1992 season finale, won by Kulwicki in part because Allison wrecked early. The stage was set for three new drivers to star in NASCAR and challenge Dale Earnhardt’s long reign of NASCAR dominance. The following year, a pair of aviation accidents in a span of 102 days altered NASCAR permanently. Kulwicki died in an April 1 plane crash returning to Bristol Motor Speedway from a sponsor appearance. Allison died July 12 when he crashed the helicopter he was piloting in the infield at Talladega Superspeedway, where he’d gone with Red Farmer to watch Neil Bonnett’s son test for his Busch Series debut. Gordon had a quiet rookie year while Earnhardt went on to his sixth championship and added his seventh title the next season. Gordon eventually took Allison’s role as Earnhardt’s nemesis by dethroning him in 1995. Gordon won four titles over seven seasons. Earnhardt never won another. Gordon spoke at length of how good timing and lucky breaks aided his career, particularly when he was hired by Rick Hendrick to move to the Cup series in 1992. “All the hard work, seizing the moment as often as possible in every good car I had a chance to drive, introducing myself to anyone I could, hoping and wishing that the right person or car owner saw enough in me to take a chance — and Rick Hendrick was that individual,” Gordon said. His induction into the Hall of Fame completes the famed No. 24 team as Hendrick and crew chief Ray Evernham are already members. Gordon was inducted by Hendrick, his daughter Ella and son Leo. He was introduced by Kyle Larson, who followed his childhood idol out of California through sprint cars into NASCAR. Jim Hunter, NASCAR’s former spokesman, was posthumously awarded the Landmark Award for contributions to the sport. Kulwicki, who moved from Wisconsin to Charlotte in 1984 with a car he built himself towed by his pickup truck, was honored by fellow Wisconsin native Matt Kenseth and Felix Sabates, the executor of Kulwicki’s estate. Kulwicki was the reigning NASCAR champion at the time of his death — he beat Bill Elliott in the 1992 season finale by 10 points to win the title — and Sabates noted that Kulwicki spent $2.84 million on his championship season. “Somewhere he’s doing his trademark Polish victory lap because tonight he’s a NASCAR Hall of Famer,” Kenseth said of Kulwicki’s celebration of driving clockwise so his window faced the fans. Allison, a beloved member of the “Alabama Gang,” was honored with a video message from Alabama football coach Nick Saban. He was introduced by Matt Crafton and Regan Smith, and inducted by his son, Robbie. The son of Hall of Famer Bobby Allison and nephew of Donnie Allison, Davey Allison learned his skills around Alabama tracks and his break came in 1987 when he replaced Cale Yarborough. He finished second in the next season’s Daytona 500 to his father, the only father-son 1-2 finish in NASCAR’s signature race. Penske, the icon of motorsports, last year celebrated Team Penske’s 500th victory as an organization. He won the Cup championship with Joey Logano and the Indianapolis 500 with Will Power. He was introduced by Logano, Brad Keselowski and Ryan Blaney, and inducted by his son, Greg. “He’s known as ‘The Captain’ but to us, he’s also known as a mentor, fierce competitor, role model and friend,” Logano said. Penske in 2016 celebrated his 50th season in racing. He built the two-mile speedway in Fontana, California, in 1996, and at one time owned Michigan International Speedway. “He’s a true titan of industry and a leader in advancing the popularity of American motorsports for more than 50 years as a team owner, track owner and even a driver,” Blaney said. Penske credited motorsports with building his corporation and setting the pace for his success. Roush was introduced by Ricky Stenhouse Jr., one of his current drivers, and inducted by 2017 Hall of Fame driver Mark Martin. Roush, who wore his trademark Panama hat for his induction, said few expected him to succeed when he launched his NASCAR team in 1988. But Roush drivers have won a record 322 races across NASCAR’s three national series and the organization has five national series owner championships. Roush is a graduate-level mathematician, engineering entrepreneur and a strong supporter of the Detroit automotive scene and Ford Motor Co.
“Few if any knowledgeable fans and even fewer Cup team personnel would have given me favorable odds of surviving for more than three decades, as I stand before you tonight,” Roush said. CHARLOTTE, N.C. (AP) — There was no need for Roger Penske to stay awake for Daytona’s 24-hour sports car race. Penske has people to do that for him, and hanging out atop a pit stand watching telemetry for two trips around the clock is slightly below his paygrade. When he did it last year, Team Penske’s return season to sports cars racing, somebody had dared “The Captain” to hunker down for the entire Rolex 24 at Daytona. It was an impressive effort many who are far younger than Penske have failed to complete. Once he had finished the first 24-hour race it seemed silly to do it again, particularly during the cold and blustery rainstorm that drowned Daytona International Speedway on Sunday. But Penske had committed to be part of the team for the entire event and Team Penske, so organized and unflappable, had meticulously prepared for the conditions. Penske’s transporter was stacked with thermal underwear — “I’ve got my ski stuff here,” he said — heavy water resistant coats and black beanies branded with the Penske mark. The pit stand had been renovated to create additional space so Penske didn’t have to sit all night, a lesson learned from last year’s race, and overhead heaters had been installed. When the poor weather finally hit the speedway, the crew zipped clear flaps and enclosed the pit stand to escape the wind and torrential rain. A month shy of his 82nd birthday, in the heaviest rain many racing veterans had ever seen, Penske pulled his beanie down low and hunkered down for an all-nighter. His reasoning? Should he step away even briefly and one of his two cars had some sort of problem, Penske wanted to be present for problem-solving and strategic decisions. “I could never do that, I could never stay up,” said Penske driver Ricky Taylor, who noted after the final practice session before the Rolex that Penske had noticed an irregularity on the track and found Taylor to show him where to avoid. Helio Castroneves, winner of three Indy 500s for Penske, wasn’t at all surprised to see his boss there for the long haul. Penske had a sensible rebuttal for Castroneves’ claim that the boss rarely sleeps. “Guess it all depends on if it is something worth staying awake for,” he said. Next up is Penske’s Friday night induction into the NASCAR Hall of Fame’s 10th class, which was one of the most competitive elections in years. 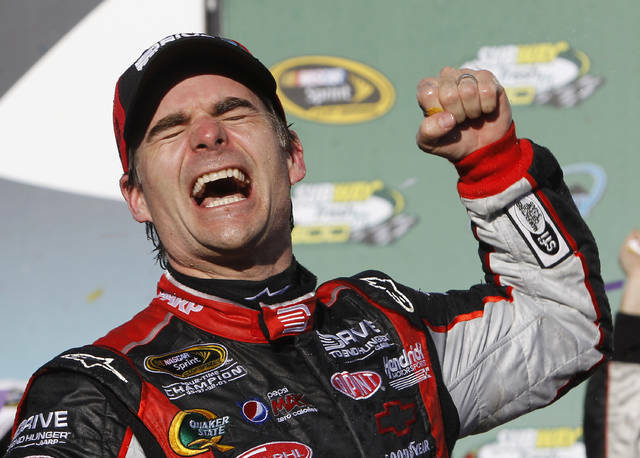 Jeff Gordon is the headliner , along with Davey Allison and Alan Kulwicki, drivers both killed in aviation accidents at the prime of their careers. Team owners Penske and Jack Roush, a pair of Detroit fixtures who intertwined their many business interests with the automotive industry and motorsports, were elected together. “Listen I’m just glad they let guys in from the North,” Penske joked about his induction with Roush. Both team owners had been on the ballot several years before they were voted in last May, shortly before Will Power won Penske another Indy 500 title. Penske was elected based on his entire body of work, even though this Hall of Fame is specific to NASCAR. The voting was done five days before the biggest Sunday in racing of the year. 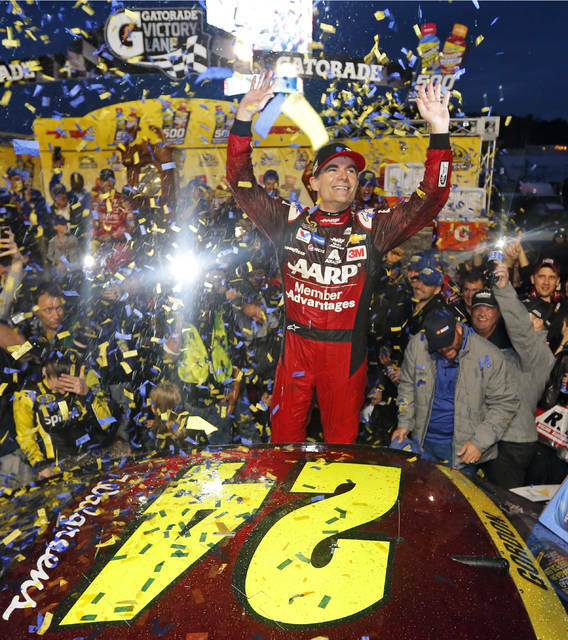 Penske started his day with four Chevrolets racing at Indianapolis, where Power won, then the action resumed in North Carolina at the Coca-Cola 600 with three Penske Fords and a fourth affiliated car in the field. The election was one part of a season in which Penske won both the IndyCar races at Indianapolis Motor Speedway, the NASCAR race at the Brickyard, the organization’s 500th overall victory and NASCAR’s cup title. Penske’s long-awaited return to sports car racing was completed last season with a two-car Acura effort, and Scott McLaughlin won the Virgin Australia Supercars title one week after Joey Logano’s surprise Cup championship. Across all his platforms, it was the most consistent season for Penske, who in NASCAR now has two Cup titles and two Daytona 500 victories. Penske leads by example with standards that require immaculate, crease-free uniforms and a commitment to excellence and professionalism. When Alexander Rossi was hired to join Penske’s Rolex lineup, he shaved his beard on his final day of Christmas vacation and arrived in Daytona with a clean face for the first time in years. No one told him to shave, he just assumed it was the Penske way of doing things. The organization is indeed buttoned up to Penske’s preferences, but it’s not as straight-laced as outsiders perceive. They understand Penske is the man they must please and that he prefers winning but mandates a standard of excellence to all his processes. CHARLOTTE, N.C. (AP) — A pair of aviation accidents in a span of 102 days altered NASCAR by claiming two stars in their prime. Alan Kulwicki and Davey Allison died just over three months apart during the 1993 season, which also happened to be Jeff Gordon’s rookie year. Kulwicki was the reigning Cup champion at the time of his death and Allison the best bet to end Dale Earnhardt’s reign. The verdict was out on Gordon, an outsider from the West Coast who had come from sprint cars to make his mark on a predominantly Southern sport. Wherever Gordon was headed in NASCAR, Allison and Kulwicki were going to be in his path. Gordon had a quiet rookie year while Earnhardt went on to his sixth championship and added his seventh title the next season. Gordon did eventually take Allison’s role as Earnhardt’s nemesis by dethroning him in 1995. Gordon, Allison and Kulwicki, forever intertwined in NASCAR history, were set for induction into the NASCAR Hall of Fame together on Friday night. Roger Penske and Jack Roush, Detroit-based stalwarts of the auto industry and champion team owners, complete the 10th class. Davey Allison was born into a racing family and although he preferred playing football, he was a member of NASCAR’s vaunted “Alabama Gang” and settled on driving cars. He is the son of Hall of Famer Bobby Allison, a nephew of Donnie Allison, and he learned his skills at Alabama tracks. His break came in 1987 when he replaced Cale Yarborough in Ranier-Lundy’s Ford Thunderbird and won two races and rookie of the year honors. The next season he finished second to his father for the only father-son 1-2 finish in Daytona 500 history. The 1992 Daytona 500 is among Allison’s 19 career victories, and he entered the infamous 1992 season finale ranked first in the championship standings but crashed during the race. He fell to third in the final standings and his fatal helicopter crash was 16 races into the 1993 season. He made his Cup debut in the 1992 season finale, the last race of Richard Petty’s career, and three years later was the youngest NASCAR champion in the modern era with his first title at the age of 24. Gordon added championships in 1997, 1998 and 2001, and his 93 Cup victories rank third on the all-time list. Gordon won the Daytona 500 three times, the Brickyard 400 a record five times and holds NASCAR’s “Iron Man” record with 797 consecutive starts. Gordon’s rivalry with Dale Earnhardt drew new fans to NASCAR, and his charisma and savvy business sense pushed the sport beyond its regional boundaries. He’s largely credited with attracting global corporations to NASCAR as new sponsors. He was a short-track racer from Wisconsin when he arrived in Charlotte in 1984 pulling a self-built race car with his pickup truck but Kulwicki was determined to make it in NASCAR. He was the 1986 rookie of the year driving for his own AK Racing team, which operated with limited sponsorship and small budget. Kulwicki repeatedly turned down better offers to join established teams to run his own program and he did it successfully. The first of his five career victories was in 1988 at Phoenix, where he unveiled his “Polish Victory Lap” — a celebratory cool-down lap clockwise with the driver window facing the fans. He overcame a 278-point deficit with six races remaining in the 1992 season to win the Cup title by 10 points over Bill Elliott in what was the closest final championship margin of its time. Kulwicki was named to NASCAR’s 50 Greatest Drivers list five years after his 1993 death in a plane crash. Team Penske celebrated its 50th year in racing in 2016, the same season the team owner earned his 100th victory in NASCAR’s Cup Series. His drivers have won two Cup titles and two Daytona 500s, and Penske tied an Xfinity Series record with three consecutive owner championships from 2013 to 2015. His election last May came days before Penske won the Indianapolis 500 for a record 17th time and in a season in which the organization also swept the major races at Indianapolis Motor Speedway, won the Australian Supercars championship, the organization’s 500th victory and the Cup title with Joey Logano. Penske also built the two-mile speedway in Fontana, California, in 1996, and at one time owned Michigan International Speedway. Roush owned drag racing teams but turned to NASCAR in 1988. Roush Racing became a hotbed for young talent and Roush is credited for launching the careers of Mark Martin, a Hall of Famer, champions Matt Kenseth and Kurt Busch, as well Jeff Burton, Greg Biffle and Carl Edwards. Roush teams have won a record 322 races across NASCAR’s three national series and the organization has five NASCAR national series owner championships. Roush is a graduate-level mathematician, engineering entrepreneur, strong supporter of the Detroit automotive scene and Ford Motor Co., as well as a pilot. He was involved in two near-fatal plane crashes, including a 2002 scare in which he was rescued by a bystander from his capsized plane in an Alabama lake during Talladega race weekend. Eight years later, Roush lost his left eye when he crashed during an aborted landing in Wisconsin. ARCADIA, Calif. (AP) — Bob Baffert’s second-string colt won a Kentucky Derby prep race. Don’t discount Mucho Gusto. Last year, Baffert’s top Derby hopeful McKinzie got injured. Second-stringer Justify went on to sweep the Derby, Preakness and Belmont, giving Baffert a second Triple Crown in three years. Mucho Gusto won the $150,000 Robert B. Lewis Stakes by 4¾ lengths at Santa Anita on Saturday. Ridden by Joe Talamo, Mucho Gusto ran 1 1/16 miles on a sloppy track in 1:41.81. The 3-year-old chestnut colt paid $3.20, $2.20 and $2.10 as the 3-5 favorite. Mucho Gusto was purchased for $625,000 at the Timonium sale near the Maryland home of owner Michael Petersen. Baffert and Petersen saw the colt work in the slop before the sale and “he just smoked over it,” the trainer said. “I texted Bob to see if I should come out for the race and he was very confident,” Petersen said. Gunmetal Gray returned $2.40 and $2.10, while Easy Shot was another half-length back in third and paid $2.60 to show. Magnificent McCool was fourth. Kid Cantina was pulled up at the top of the backstretch. Nolo Contesto was scratched, reducing the field to five. Baffert earned his seventh win in the Lewis, named for his late client with whom he won the 1997 Kentucky Derby and Preakness with Silver Charm. Mucho Gusto has three wins in four career starts. He’s a son of Breeders’ Cup Classic winner Mucho Macho Man. Baffert saddled 1-2 favorite McKinzie to a second-place finish in the $200,000 San Pasqual Stakes. The 4-year-old colt got edged near the wire by Battle of Midway after they battled through the stretch. — Harvey Wallbanger scored an upset at 29-1 odds in the $350,000 Holy Bull Stakes, winning by a length at Gulfstream Park. Ridden by Brian Hernandez Jr., Harvey Wallbanger ran 1 1/16 miles in 1:43.69 and paid $61.20 to win. Sent off at 99-1, Everfast finished second. Previously unbeaten Maximus Mischief, the odds-on favorite, was third. Trained by Ken McPeek, Harvey Wallbanger was purchased for $50,000 as a yearling. He is named for the 1970s drink that contains vodka, orange juice and an Italian liqueur. — Tax surged up the rail to overtake Our Braintrust and Not That Brady in deep stretch and win the $250,000 Withers by a head at Aqueduct. Ridden by Junior Alvarado, Tax ran 1 1/8 miles in 1:50.27. The gelding paid $6.20 to win as the 2-1 favorite trained by Danny Gargan. Tax earned 10 qualifying points for the Kentucky Derby. He more than tripled his career earnings to $186,300 and has never been worse than third in four starts. Not That Brady was second, a neck ahead of Our Braintrust, trained by Mark Casse. Casse lodged an objection against Not That Brady for the bump in the stretch, but there was no change to the order of finish.